I fished here last year using light tackle and maggots, hoping to get some nice roach and skimmers. It was fairly quiet that day, nothing to write home about, but the lake came to life late in the day and I was snapped three times in quick succession by carp in the margins. The bailiff told me afterwards that the carp come in really close as they are used to being fed pellets late in the day. With this in mind, I never bothered with the float rod and light tackle today. 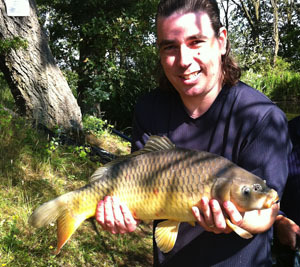 The fish that had snapped my line last year had to be double figures, so I set up my carp rod and went with 8lb line. Bait was luncheon meat, with red food dye added as well as some paprika. It didn't take long for my first fish, hooked in the margins to my left. Not what I was hoping for though, it was a small mirror of around a pound at most. It was fairly quiet in the margins, which was to be expected as like I say, the carp generally come in later in the day. I was baiting up close in by a reed bed, thinking it would pay off later on. For now though, I was going to fish further out. I was in peg 23, which meant I had the option of casting between two islands. I stayed tight to the left one and catapulted some meat and halibut pellets out there. I had two nice commons from that swim over the next hour or two, and also lost one that would have been even bigger based on the brief fight it put up before shedding the hook. I'd continued to bait up the swim close in, and after a while I changed my hookbait to halibut pellet and dropped it into the margins by the reedbed. Not long afterwards the rod was almost dragged into the lake and I was into a really nice common. It put up one hell of a fight before I eventually got it in, and I'd guess it weighed around 12lb. The margin swim went quiet after that for a couple of hours, but I managed to pick up another couple of carp from the island swim and lost another nice one. I'd switched back to meat at this point, and I stayed with that for the rest of the day. As it began getting later, I went back to the margin and pulled in another two carp, a smallish common and finally a chunky mirror that was pushing double figures. The gates were being locked at 9pm, so I could have stayed a while longer but I was starving so called it a day an hour early. As I walked back along the bank, I could see plenty of bubbles close in where the carp had moved in to feed. If you fish here, definitely try fishing the margins towards the end of the day as the action is pretty frantic and the fish here really go. Stay close to your rod too as it only takes a second for them to drag it in, and it's not just the big uns that can do it. My rod was almost pulled in by a fish that couldn't have weighed more than 3lb. In summary, not counting the first tiddler, the fish I caught went from between 3-12lb I'd say. As well as providing good fishing, this is a very picturesque lake and it's an enjoyable place to fish.